Why Not Add Emergency Accident Contact Details to Your Obsolete Licence Disc Holder! 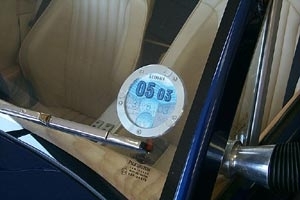 You have probably realised by now that with the new electronic road tax system the old tax disc holder in your car or on your bike is now obsolete. Well PC Dave Wise and the policing team from Worcestershire have thought up a new use for them – accident contact details and medical alert card holder! PC Wise said: “This is a really useful replacement for your tax disc. If a driver is involved in a collision or has a medical emergency whilst at the wheel, a first responder will have easy access to vital medical information and we can quickly contact next of kin. The template can be easily printed out, cut out, filled in, folded up and placed in the holder. This article was added on Friday, October 17th, 2014 at 3:09 pm and is categorised under General News. Both comments and pings are currently closed. Error: Error validating access token: Session has expired on Saturday, 09-Mar-19 13:12:58 PST. The current time is Thursday, 25-Apr-19 05:56:12 PDT.